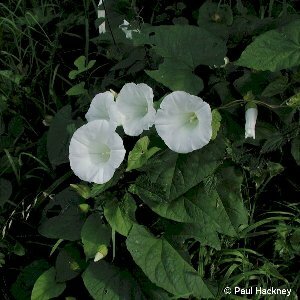 A handsome white-flowered bindweed of hedges near houses. Introduced, presumably for gardens, but not now in cultivation, and only 'wild' plants occur. 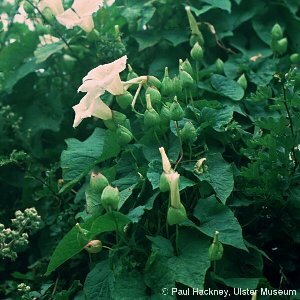 The flowers are the largest of any bindweed and the bracts at the base of each are swollen and 'inflated' in appearance. A common variant has the flowers divided into five separate petals instead of the usual trumpet.